[Episcopal News Service] Presiding Bishop Michael Curry will travel this weekend to the Diocese of East Carolina for a pastoral visit focused on hearing the stories of Episcopalians recovering from two hurricanes that hit the Southeast in September and October. Hurricane Florence made landfall near Wilmington, North Carolina, on Sept. 14 with 90 mph winds. A month later, Hurricane Michael also passed through North Carolina, though the worst damage from that storm occurred on and near the Florida Panhandle, where Michael made landfall Oct. 10 as a major hurricane with 155 mph winds. After visiting East Carolina, Curry has scheduled a pastoral visit to the Diocese of the Central Gulf Coast to meet with Episcopalians in the Florida Panhandle on Jan. 12 and 13. “We’re very grateful that he’s coming to East Carolina to see firsthand and just to be with us,” said the Rev. Paul Canady, rector of Christ Episcopal Church in New Bern, North Carolina, one of the communities hit hard by Florence. Although Canady’s church wasn’t badly damaged in the storm, 31 families in the congregation were displaced, and some still are waiting nearly three months later for completion of repairs that will let them return to their homes. Southwest of Wilmington, the congregation of St. Philip’s Episcopal Church in Southport has been worshipping in a meeting hall of the local Moose Lodge while repairs to the congregation’s sanctuary, chapel and administrative buildings are underway. All three buildings were severely battered by Florence and will require new shingle roofs and replacement of flood-damaged walls and floors. Some members of the congregation were hoping to return to worshipping in the St. Philip’s sanctuary by Christmas. The Rev. Jim Hanisian, priest-in-charge, said Easter would be a more likely timeline, but even that is uncertain. For now on Sundays, the congregation travels seven miles from St. Philip’s to its temporary home, where a giant moose head on the wall is waiting to greet them. Once inside, a left turn takes you to the Moose Lodge bar; parishioners instead take a right turn into a bingo hall that the congregation coverts once a week into a makeshift worship space for the 8 a.m. and 10:30 a.m. services. “It’s kind of an adventure,” Hanisian said, telling the story of someone accidentally turning on the disco ball in the hall and initially struggling to figure out how to turn it off. Florence and Michael were the two most devastating storms in 2018’s particularly active hurricane season, with Florence blamed for the deaths of 50 people. Michael, said to be the third-strongest hurricane to hit mainland United States, killed at least 40 people. The two storms brought intense wind, rain and flooding that left a path of destruction from the Gulf Coast to coastal Virginia. Episcopal dioceses across the region coordinated their emergency response and relief efforts before, during and immediately after the storms with help from Episcopal Relief & Development. The Diocese of East Carolina, which covers the coastal third of North Carolina, received a $20,000 emergency grant from Episcopal Relief & Development, and the money was distributed through microgrants to 13 different ministries in the diocese. Christ Church in New Bern was among the microgrant recipients, using $2,500 to help some residents meet emergency housing needs in the days and weeks after Florence, Canady said. The church used a second microgrant to host a children’s program similar to vacation Bible school for students initially unable to return to classes while their schools were closed. The diocese also has received an outpouring of support from Episcopalians across the country. The diocese maintained an online Hurricane Hub with emergency information during the storm, and it continues to update its relief and recovery page. Bishop Robert Skirving sent a letter to the diocese on Oct. 4 applauding the work of neighbors helping neighbors and urging church members to continue supporting all those affected by Florence. The letter also noted that, at that time, 24 parishes in the diocese had filed insurance claims due to damage on church properties. Among the damaged properties was Trinity Center, the diocese’s retreat center on the coastal Outer Banks. Many of the center’s buildings had to be repaired, renovated or rebuilt, and the center began slowly reopening to groups in late October. “We still have a long road ahead of us as we continue to prioritize projects, but our friends and supporters have made that road seem much shorter,” the center said on its website. Other churches were mostly spared by the storm and able to assist their communities in the aftermath. 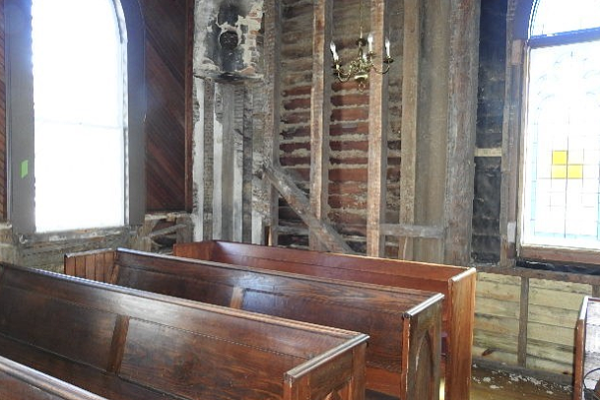 St. James Parish, Wilmington’s oldest church, sustained only a downed tree and was able to open its doors quickly after the storm to house relief workers needing a place to stay. St. James, along with St. Anne’s Episcopal Church in Jacksonville, North Carolina, will host Curry’s two main public gatherings during his visit to the diocese. The event at St. Anne’s will be at 4 p.m. Dec. 8, and St. James will welcome Curry at 2 p.m. Dec. 9. “Each of these gatherings will provide an opportunity for those who have been doing the work of relief and recovery to share their stories and to allow Bishop Curry to respond pastorally,” the diocese said in an email to its members. St. Philip’s isn’t on Curry’s itinerary of public events, but the presiding bishop is scheduled to join the congregation Dec. 9 for a tour of its damaged buildings and then a 10 a.m. Eucharist. Some members of St. Philip’s have dealt with damaged roofs, broken windows and downed trees from Hurricane Florence, but luckily, Hanisian said, no family has been left homeless – only the congregation. So, instead of celebrating Eucharist with Curry in the damaged sanctuary or chapel, they will invite him to join them for one of their Moose Lodge services. “The big question now is whether we’re going to turn on the disco ball when he’s preaching,” Hanisian said, at least half jokingly.